Steven Knight’s script builds from its characters, but there’s nothing substantial to begin with. 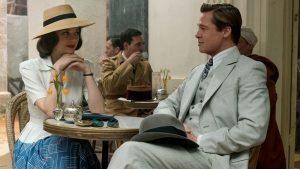 The World War II film follows Canadian intelligence officer Max (Brad Pitt) and French Resistance fighter Marianne (Marion Cotillard), from the moment they rendezvous in French Morocco to assassinate the German ambassador to their married life in London, England, where Max is informed that Marianne may be a German spy. What drives these two storylines is their romance, but since it’s never convincing, the entire film runs aground. The issue is twofold: their romance is rushed, and even as it hurries along, I never get the sense that Max is falling for Marianne because he’s so uptight around her and impassive toward her until this one moment that just comes out of nowhere. While it’s easy to believe that Marianne loves Max, the same can’t be said for the other way around, even after they marry. With the film’s second half, Max’s actions stem from the apparent fact that he loves Marianne, but that’s something that I never believe; as a result, his actions lack conviction, and the film becomes inert. Knight seems to be aware of this, and the inclusion of their baby daughter Anna serves two purposes: to emphasize the weight of the revelation regarding Marianne, and to introduce opportunities for emotional manipulation and sap, which the film shamelessly takes advantage of. As for the two storylines (an assassination plot and a mystery thriller), Knight goes through the motions without any sense of excitement, as both sorely miss feelings of anxiety and danger. The film’s classic and old-fashioned premise feels like one that could have been brought to the big screen back during the ’40s, ’50s, or ’70s, but it’s missing heart. The film is designed to be a story about two people, but it’s honestly a one-person show that falls flat on its face. I can’t say whether Pitt is going off the script or director Robert Zemeckis’ instructions, but his performance is absolutely dull. Part of why Max’s love for Marianne doesn’t convince is because of how detached he is around her, so when Pitt displays affection toward her, it feels forced. In addition, the actor seems to distractingly change age between sequences – sometimes, he looks really young to the point where his face seems like a CG creation. It doesn’t help that he boasts star power that overwhelms his performance, so it’s far too easy to see Max as Brad Pitt himself as opposed to a character. Cotillard fares much better in that she sells her emotions very well, and Marianne’s love for Max is never in doubt. Naturally, she is the more compelling character, and while it’s disappointing how the film relegates her to the sidelines in the second half, the actress does well with her scenes. 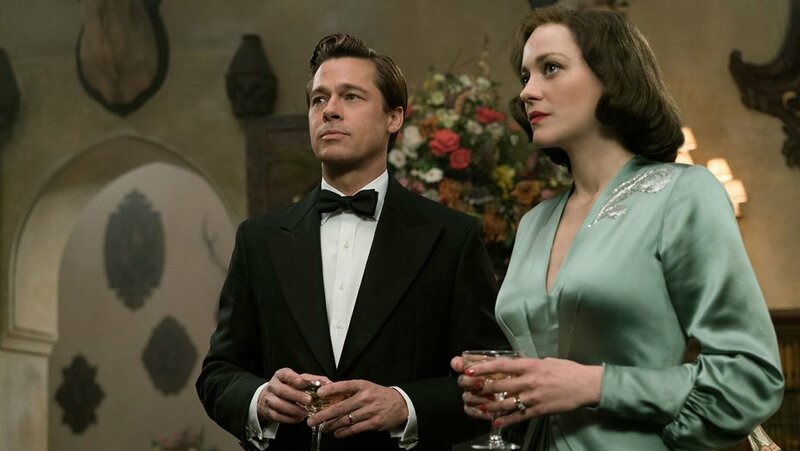 The chemistry between these two is admittedly close to nonexistent, as Cotillard clearly puts more effort in the relationship than Pitt does. There are a number of supporting characters, but they all prove to be quite inconsequential. The most prominent example is Max’s lesbian sister Bridget (Lizzy Caplan); under different circumstances, it’d be nice that the film features an LGBTQ character, but here, she has no influence at all in the proceedings, so she’s really nothing more than a token LGBTQ character. It certainly does look and sound pretty at times, but the film has a noticeable pedestrian attitude about it. Frankly put, Zemeckis doesn’t seem to care about this story, and I have a feeling that the film is a studio job that he was contractually bound to direct for Paramount Pictures. The obvious reliance on mirrors as visual motifs and the disappointing visual effects – consisting of fake-looking, non-textured backgrounds and environments that stick out – indicate that the usually reliable and visually smart filmmaker is not operating on full throttle. Editors Mick Audsley and Jeremiah O’Driscoll should take some blame for the film lacking drama; from the rushed romance to a random raid sequence in the second act that lacks drive, the film stutters from beginning to end. 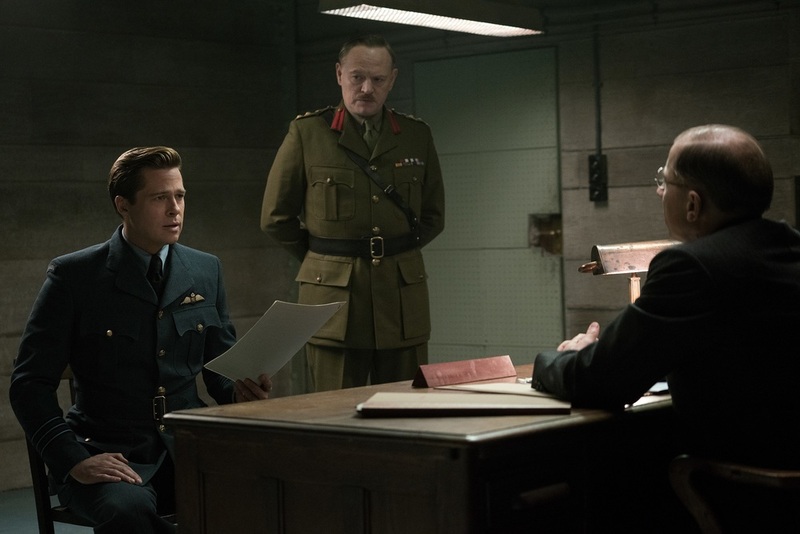 Gary Freeman’s production design is terrific, as his recreations of Casablanca – which intentionally evokes the classic 1942 film – and wartime London capture their respectively romantic and dangerous atmospheres during this period. The characters are consistently dressed to kill in Joanna Johnston’s neat and stylish costumes, which command our attention. Alan Silvestri’s score is wasted; it’s a suitable fit for thrilling sequences and moments that tug at the heartstrings, but the scenes that feature such music fail to match the emotions within the notes. Since the romance at the heart of Allied doesn’t feel mutual, it neuters the film, undermining the drama and emotions at play. It’s almost incredible how the entire picture hinges on its love story; when it doesn’t work, almost nothing does.